Can young people who've been injured in knife and gun crime be steered towards a safer future at the moment they're at their most vulnerableOne of the city's four major trauma centres, if you are in a serious accident, or you are stabbed or shot, this is where you may end up. It is an extraordinary place. 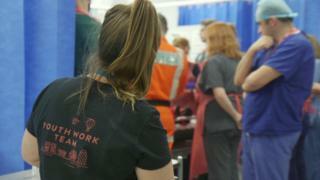 Green-overalled ambulance crews constantly arrive to be met by teams of medical staff in coloured scrubs. Sometimes there are wails of pain from patients. The public address system blares urgent announcements. The ring of the "red phone" cuts through it all - warning the medics of an incoming patient. Tonight it's a "paediatric, code red". A child, with life-threatening injuries. He arrives, dressings marked with blood, on a trolley surrounded by paramedics and is handed over to a 10-strong team of waiting trauma specialists. Senior consultant Dr Emer Sutherland marshals her team. The patient is 16. He has been slashed four times with a large knife. In the course of the next few hours, the resus team will ensure he lives. They're good at what they do. Only three young stabbing victims have died in the hospital this year.But there's another specialist alongside them. Lucy Knell-Taylor is 29, dressed in a T-shirt and leggings. She's not a doctor, but a youth worker with the charity Redthread. She is there not to save a life, but to change one. We spent four days at King's, during which time we saw a steady flow of patients with stab wounds - almost all of them under 18. The peak time for admission was not late at night, but at school going-home time. After a decade of falling levels of violent crime, they are now increasing again. Reported knife crime rose 26% in the last year. In London, 21 teenagers have been murdered, 15 stabbed to death. Redthread is trying to help young people escape what for many is a life riven by violence. To achieve that, youth worker Lucy has to wait for the right time. When victims are able to talk, she moves in among the medical team and begins the task of building a relationship with someone she's never met, who may be traumatised and hostile, while they are having emergency treatment. Some respond well. One gestured to his wounds and said to Lucy: "I want you to look at it and tell me what they are doing." Others are more difficult. Many young men involved in criminal gangs who won't even tell her their "government" or real name. She's been called a "pagan", meaning "you're not one of us".She is often told: "I slipped on glass." In resus, they know that's usually code for "I was stabbed." She responds with reassurance, practical help and personal warmth. Forging a relationship is everything. Redthread calls this "the teachable moment". When someone is critically injured, they are suddenly removed from the streets. They are dependent on doctors for their survival. They may be in pain. The aim is to teach them that this is a moment they should grasp. A junction in their lives where a choice can be made. To go back, or to move on. "Getting to them now when they are here in the hospital," Lucy Knell-Taylor says, "is my opportunity to say every single thing which has happened before this second, kind of doesn't matter. "Right now you're in pain, you're away from your natural environment, your friends may or may not be here. This is an opportunity to think - does something need to be different? "It's live, it's the moment it's most real to them. It's the perfect moment." When it works, a bond is formed between Ms Knell-Taylor and the victim. It means she can later say "You can trust me. I've seen your pain face! "But it can be traumatic work. Ms Knell-Taylor describes one incident when, called to resus, she was confronted with a large group of "road men" - gang members. One turned, and a kitchen knife was sticking out of his eye. She has seen patients die. Dr Emer Sutherland helped set up the project 13 years ago. "I am a middle-aged mum," she says. "I don't have the same experiences young people have. "I can keep them alive, I can resuscitate them, but then my expert colleagues - the youth workers - come in to offer them what they want for the future." The teachable moment is designed to open the door to potentially years of work aimed at extracting victims from a violent life. Ms Knell-Taylor has argued for "her people" in court, fought battles with probation officers, sorted housing, and even organised transport for one patient who couldn't go to a certain hospital because he might be stabbed passing through a rival group's territory. Jane - not her real name - is one of Redthread's successes. Now in her 20s, when she was a teenager, she became involved in a drugs gang and was forced to carry guns and knives around London. "I saw a man get both of his legs broken," she tells me. She was sexually abused and sent to be raped by rival gangs, as part of a bizarre arrangement used when her gang had done something which might otherwise result in its rivals retaliating violently. "If your girl had to sleep with a guy from another gang, it was like they had one up on you. The girls were used as pawns," she says. Unwell, Jane came to King's. Hospital staff opened the door to the teachable moment by tipping off Redthread that she would be at a clinic the next morning. "It was probably one of the lowest points in my life," she says. "I wasn't feeling great, and in that moment Becky was there to help me." Becky is Becky Calnan, an experienced Redthread worker who has now been with Jane for years. "I just felt an automatic connection that actually this was someone who - regardless of what I was involved in - was going to help me," Jane says. "Since then, I've probably spoken to her every other day for years. She's helped me rebuild relationships with my family, get me back into a community. ""Ideally I'd like her to be in my life for… well, forever." But in fact their work connection recently came to an end. Jane accepts that as "a mark of how far I've come". Lucy Knell-Taylor says success is measured by her services no longer being needed. "I try and work on this Nanny McPhee principle of when you need me but don't want me I'll be there, but when you want me but no longer need me, I won't," she says. A recent report on the charity's work at St Mary's hospital suggested it had led to a 60% reduction in the number of young people coming back to the emergency department as victims of violent crime. However, it has proven tricky for Redthread to show wider evidence of its success, because of a lack of funding for studies of what happens to the young people it contacts. Now the project's being expanded to three hospitals in Birmingham and Nottingham which will provide an opportunity to measure the effect of the "teachable moment" both before and after Redthread gets to work. The intensive one-to-one relationships with young people that Redthread believes can divert them from violent lifestyles don't come cheap. Scaling up the project could get very expensive. But every case arriving in resus results in a bill to the NHS for hugely expensive specialist care. Policymakers will also have to consider the real cost of not cutting youth violence.